Have you ever heard of Major League Soccer? It’s the U.S soccer league. Now, why are we talking American sports instead of AFL or something else? We just had to share some photos from the season-opening game. 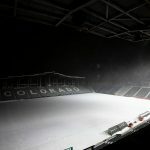 The Colorado Rapids opened the 2019 season against the Portland Timbers, it was a 3-3 draw and was dubbed the “Snow Clasico”. It. was. freezing! You’d think -7 degrees would call for the match to be suspended, but no the players and the referees played the full 90 minutes. The photos that were taken are kind of breathtaking. The assistant referee was basically frozen. Goal celebrations were a bit special. It was officially the coldest game in MLS history. The pitch looked so eery after the stadium emptied. I’ll definitely remember these photos next time I’m out on the field in the middle of July when it’s raining and I’m thinking that it’s cold.